George Seminoff was born in Hobart in 1927. After graduating, he attended OSU then joined the Navy during WWII when he was just 17 years old. 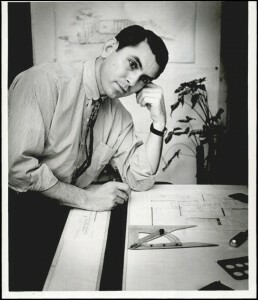 After the war, he returned to OSU and earned his architecture degree in 1950. He also completed additional studies at Harvard University. For several years, he worked for various firms, including as lead designer at Coston, Frankfurt & Short until 1959. In 1960, he established his own practice and over the years served on the Architectural Selection Committee to select the new Dean of the School of Architecture for The University of Oklahoma and on the national design committee in Washington, D.C., for the American Institute of Architects. His own home won a prestigious award of merit for its design from The American Institute of Architects in 1970 — it also appeared in a 1971 issue of Living Now magazine. George remained a busy architect until he retired in the early 2000s. He and his wife, Sharon, were very involved in establishing the Oklahoma City Arts Festival, and they were enthusiastic volunteers for the OKC Zoological Society. George died in 2013. Seminoff, Bowman & Bode, 1960-?